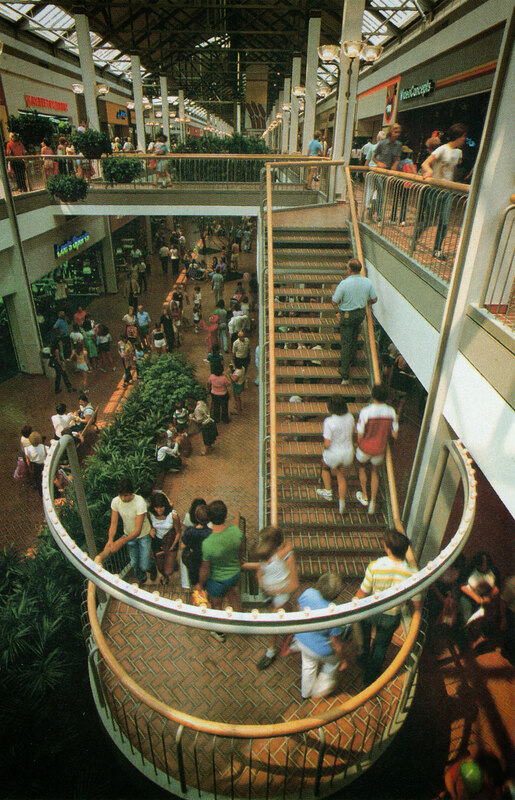 White Marsh Mall opened in August of 1981. 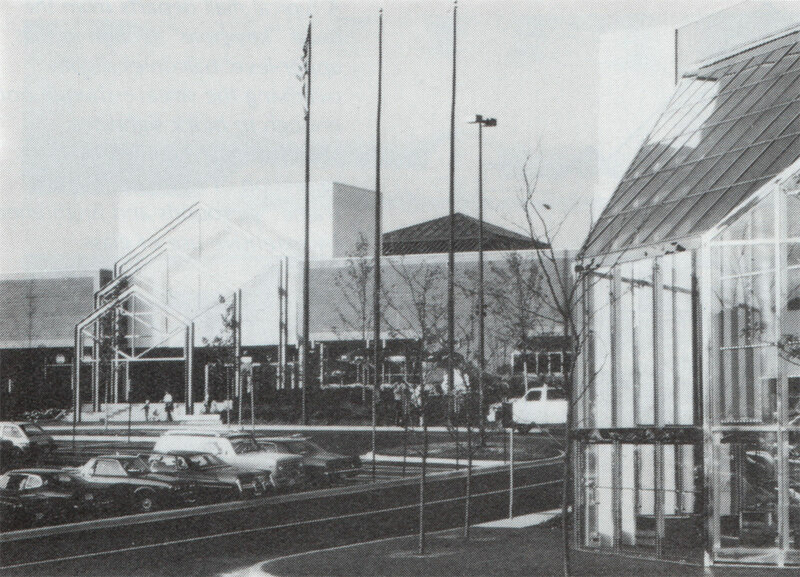 Originally the shopping mall was proposed as a 250,000-square-foot center with two major department stores as anchors. But during the 9 years of planning and development the plans grew to 370,000-square-feet with five anchors and 180 shops. Sears, who committed just one year into the planning of the mall, along with Bamberger’s, JCPenney, Woodward & Lothrop and Hutzler’s were the original anchors. The very first Boardwalk Fries also opened in White Marsh Mall in 1981. 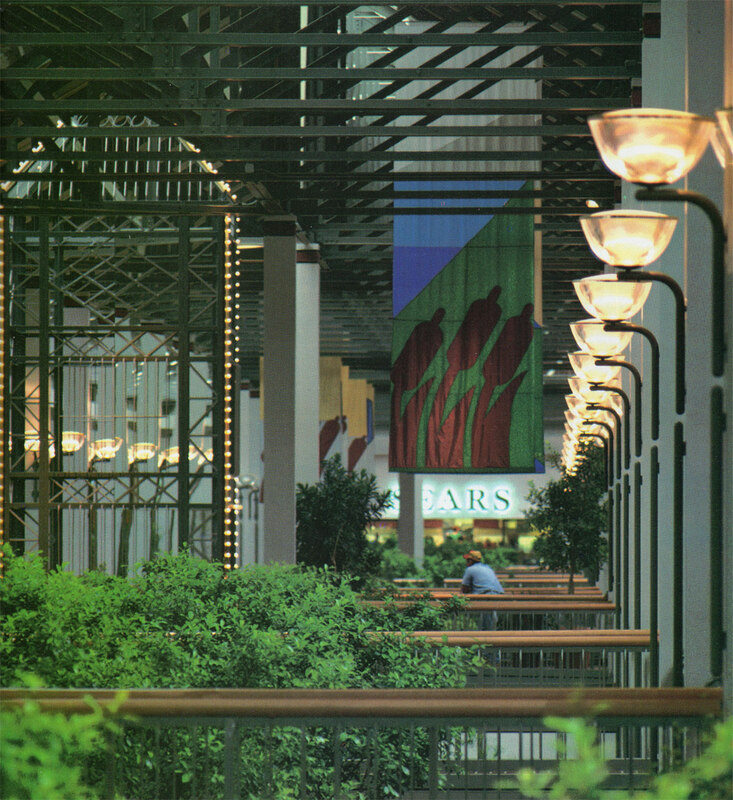 The mall itself was planned to have a Main Street feel by design. The primary street runs straight between the anchor stores at both ends. With pedestrian bridges and walkways creating the cross streets. Open to both levels of shops, the main street also has several small parks along the way in the form of intimate courts with inviting gardens, fountains and statues. 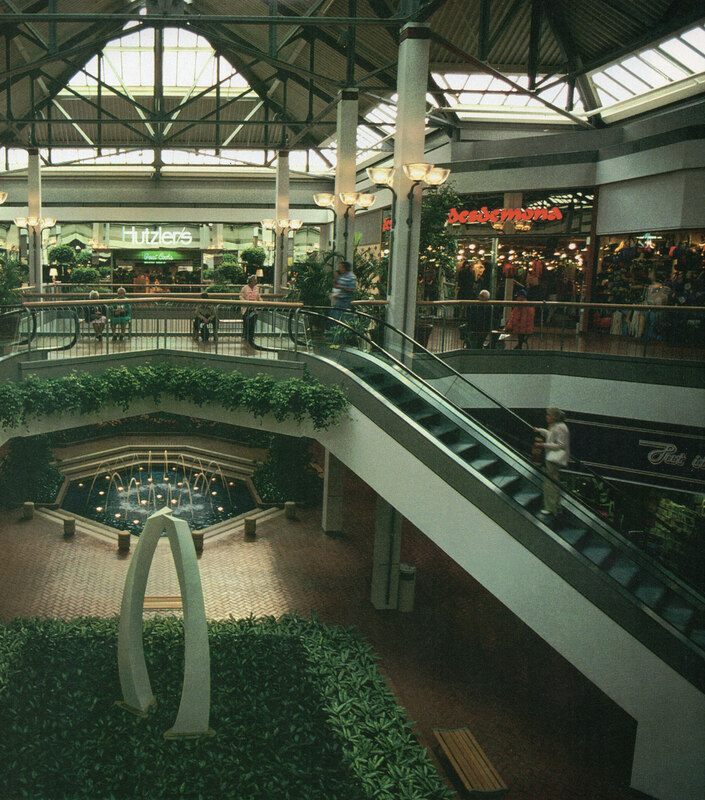 In the center of the mall is the elevator court. 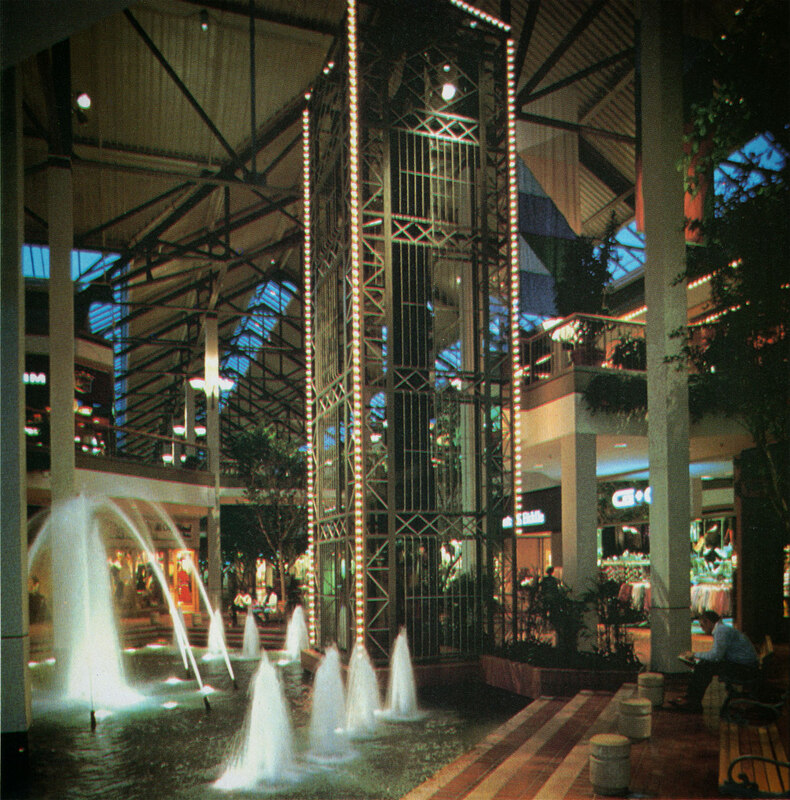 There an iron caged, glass enclosed elevator seems to rise from a large fountain. On the second floor this court leads to a spacious, octagon shaped food court designed to be the town center. Brick paving, park benches, towering trees and even a clock tower were some of the elements used through out the mall to further enhance the Main Street feel. In 2011, the mall held a 30th anniversary celebration. Some of the activities included a viewing of 1981 film “Raiders of the Lost Ark” in the former Boscov’s parking lot and an ’80s fashion show. And just an F.Y.I., mallwalkers are still invited to walk the White Marsh Mall starting at 7 am Monday through Saturday, and 10 am on Sunday.